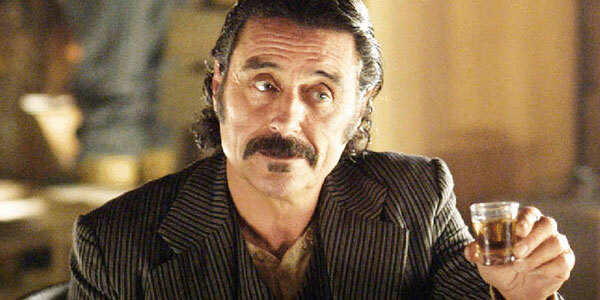 This entire article is written about Ian McShane’s character and what he’ll be doing. As such, this article is dark and full of spoilers. Read on at your own risk. I can give you one hint: My character is an ex-warrior who's become a peacenik, so I have this group of peaceful—sort of like a cult—a peaceful tribe. I bring back a much-loved character everybody thinks is dead. Ian McShane seemed very clear that he couldn’t drop any spoilers, just noting that he is bringing back a much-loved character is a big clue regarding Season 6. We do know that tons of dead characters may be coming back in Season 6. Some, like Ned Stark, should be returning via flashbacks (in Stark's case he will reportedly be a young man and played by a different actor). However, both the Hound and Jon Snow have been rumored to be dead on the series. The Hound's been gone for several seasons--ever since Arya left him for dead--while Jon Snow was just stabbed—seemingly fatally—at the end of Season 5. It’s not the latter, it might be the former. If you’ve been keeping tabs on Game of Thrones, the rumor mill had already noted that the Hound would be returning in Season 6, although if he appears in the same number of episodes as Ian McShane, his stint might be short. If you’ve read George R.R. Martin’s A Song of Ice and Fire novels, McShane’s words also seem to indicate that he will be playing Elder Brother, the head of, well, a group of peaceniks who may have taken in The Hound after Arya left him for dead. In the novels, Pod and Brienne stumble upon this group on the Quiet Isle and it is alluded to that the Hound may not be dead, after all. If the same holds true on the series, that would tie up that storyline neatly. Obviously, a lot of what we know about Game of Thrones Season 6 is based on short quotes and speculation at this point. However, we’ve compiled what we’ve learned in this handy what we know piece. In addition, be sure to tune in to HBO when Game of Thrones returns to the schedule on Sunday, April 24 at 9 p.m. ET.